The NCC has put steel collars around utility poles along their self-proclaimed Confederation Boulevard to "protect its dignity." I wonder if they've patented the idea. They might want to sell them to other capital cities around the world. A bargain at $300 - get some for the utility poles in your neighbourhood. 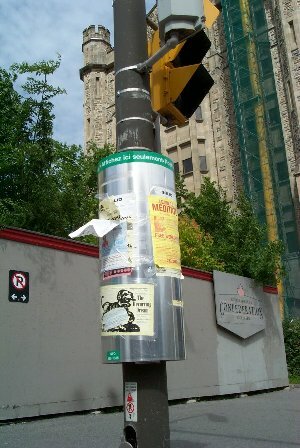 A great place for posters advocating the abolition of the NCC.